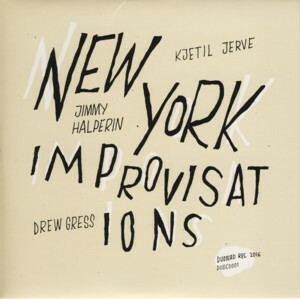 This is the debut album as a leader by Norwegian pianist Kjetil JerveFind albums by this artist, recorded in NY in a quartet setting with American saxophonist Jimmy HalperinFind albums by this artist, bassist Drew GressFind albums by this artist and an anonymous drummer (a curiosity indeed). They perform four improvised pieces, three as a quartet and one as a saxophone / piano duo. The pieces are not credited to anybody and therefore assumed to be co-composed by the participating musicians. The album was released as individually numbered limited edition of 500 copies (my copy is 130/500). The music, although freely improvised, is remarkably melodic in its nature, especially emphasized by the wonderfully lyrical tone of Halperin´s tenor saxophone. The mid to up-tempo pieces swing also quite surprisingly considering the free spirit of the music. The musicians communicate between themselves amicably and are able to create a coherent sound as a quartet, which of course is quite admirable under the circumstances. There are many excellent contributions by Halperin and Jerve, sometimes playing almost unisono, or in parallel or against each other, but always doing so with elegance and of course great skill. Halperin, which whom I have not been familiar before listening to this record, was the most surprising and powerful discovery, which will be, of course, followed through. I have heard Jerve´s recordings before as member of other different ensembles, especially the piano trio called Orter EpargFind albums by this artist, which is also quite excellent. Overall this is an excellent Avant Garde Jazz album, full of joy and vitality, completely absorbing from start to finish and highly recommended to all fans of the genre and even the more adventurous mainstream Jazz lovers.